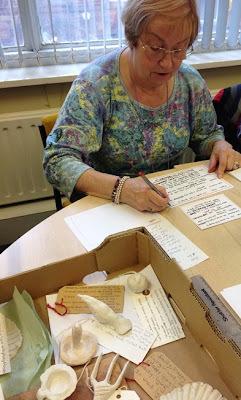 Tuesday 23rd July was our last session at Warrington Museum and I felt a big push-me-pull-you of sadness and pleasure. The group of carers we've worked with have been a delight – creative, resourceful, involved and appreciative both of Lois and myself and of each other. We'll miss our Tuesday sessions with them, without a doubt. But I also was struck by how quickly they worked today, how clear and focussed they've become - and supportive of each other, too. Their work is becoming more confident and they're developing more skill as they get stuck into each workshop. The work today was especially strong - touching and articulate. They are also becoming articulate as a group, encouraging, responding, and gently critiquing one another. It's a pleasure to see. The writing they did this week was the simplest of ideas – take a photograph of someone important to you, using only your memory and a pen. See Josie’s above, Colin’s below. All the pieces of writing and art-making that they've produced over the weeks we've worked together will now be handed over to the museum, for inclusion in the exhibits, as interventions. Some of the pieces will be linked to relevant objects via QR codes so that visitors can call up a poem or image that reflects on the artefacts in the glass cases. We’ve made a couple of sound recordings of the work. There will also be a tour, using their creative writing as a script, a kind of emotional journey through the museum. On days like this I can't imagine a better job to be doing, or better people to be with. My own image of that day - people grouped around a table, happily making.